Companies file patents all the time and it flies under the radar because most of the time it’s just techno mumbo-jumbo that we don’t understand. But Samsung recently received approval on a patent that is written in a language we all understand: rock and roll. 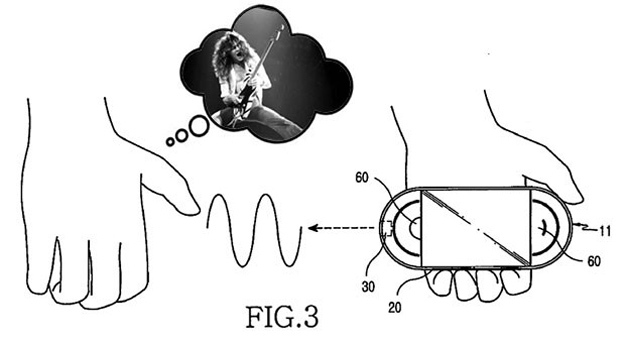 Uncovered earlier today by Engadget, U.S. Patent 8,378,202, also known as “Portable communication device capable of virtually playing musical instruments,” makes way for a music player that would allow listeners to add their own riffs to their favorite tracks. Essentially, it lets you turn every song into Free Bird. Using the sensors in your phone, this patent would presumably let your phone or tablet know when you are holding it in the “jamming” position and would turn the buttons on the side of the device into a virtual fretboard. Moving the phone up and down would simulate sliding on the neck of the guitar and motion sensors would pick up on your second hand strumming, simulating the universal sign language symbol for rocking out. The phone would then produce the sounds you’re rocking and blast them through your phone atop the music already playing. It’ll be just like having your very own virtual garage band in the sense that no one wil want to listen to your terrible music. There are no announced plans for a device that uses this patent.